Limiting afternoon naps to 20 minutes, exercising, and avoiding stimulants and certain foods will contribute to a good night sleep, with the best quality sleep derived from 10.00pm to 4.00am when the night is at its darkest. 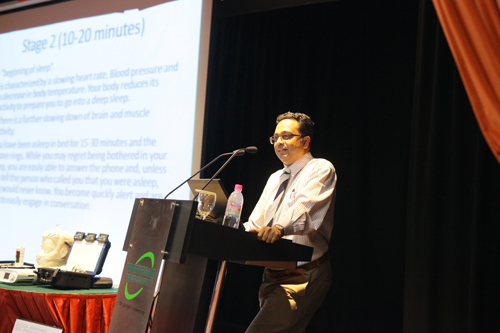 Dr Irfhan explains why it is important to get enough hours of sleep every day. 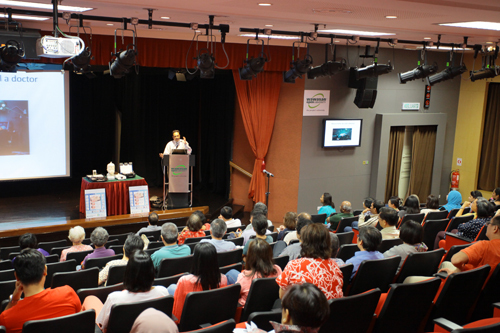 Penang Hospital consultant chest physician Dr Irfhan Ali Hyder Ali was speaking at a public talk on ‘Sleep and Obstructive Sleep Apnoea’ held at the main campus today, organised by WOU’s School of Humanities & Social Sciences and Human Resources Department. He elaborated that the melatonin spike that helps people sleep better occurs between 10.00pm and 4.00am. He stated that obstructive sleep apnoea (OSA) and other sleep problems can be detected with an electroencephalogram (EEG) which records brain activity when sleeping. 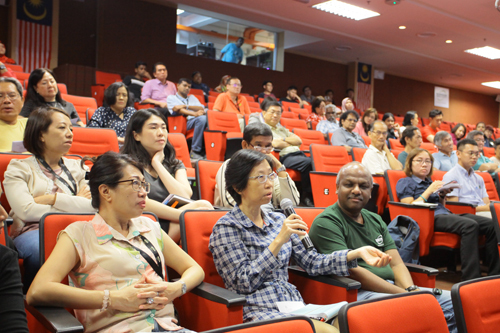 Part of the audience at the talk. Sharing about the beginning of sleep. He highlighted that in Stages 3 and 4 (30-45 minutes after sleep), you sleep through noises and movements without any reaction, and if awakened, you will feel groggy for the first few minutes. Dr Irfhan recommended taking afternoon naps of not more than 20 minutes to feel refreshed and alert, with anything longer making you lazy and lethargic. He said sleep hygiene must be considered before any diagnosis of OSA. He listed sleep hygiene tips like limiting daytime naps to 20 minutes, avoiding stimulants like caffeine and nicotine close to bedtime, exercising, avoiding heavy meals or rich foods before sleep, and ensuring a pleasant sleep environment. Describing the five stages of sleep. He said sleep apnoea occurs when a person stops breathing for 10 seconds or more and has at least a 4% drop in oxygen in the blood, while the less severe hypopnoea is a decrease in breathing. Factors like male, obese, age, alcohol, race and familial history, can influence the incidence of OSA, he remarked. WOU Acting Vice Chancellor Prof Zoraini Wati Abas presents a token of appreciation to the speaker. He said people do not stop breathing and die from OSA but that it can lead to complications like hypertension, declaring that stroke is the leading cause of death in OSA patients, while other effects are increased insulin resistance, snoring, depression, and heart attack. During Q &A, he responded that most OSA episodes occur when a person sleeps supine as then there is more chance for the airways to be blocked.